and we hope to have a successful season. a little planning has to take place. The first seed order has been officially placed! 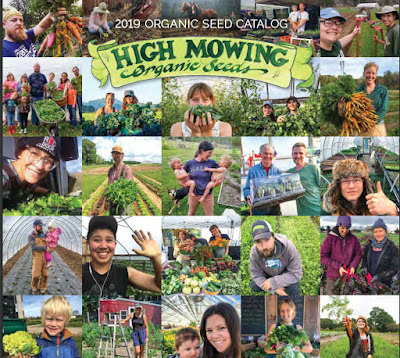 This is the first year I am ordering from High Mowing Organic Seeds. They are a conscientious company that originated in the founder's backyard. that offers over 600 varieties of heirloom, open-pollinated and hybrid seeds. If you want to learn more about the story, read this. High Mowing offered me free shipping on orders of $10 or more. I had no problem meeting that amount! is to see what I have on hand. and that way, I can try a few new things this spring. (this is only page 1). My seeds are divided up into four containers (two shown here). The spring/summer seeds and the fall/winter seeds take up two bins. I have two other bins, one for herbs and one for flowers. and began to peruse the seed catalogues. I don't really need to order too much. Of course, that doesn't mean that I won't. based on the ability to save seeds year after year. to make it easy to find just what I'm looking for. it was a bit less daunting to narrow down the new acquisitions. Those seed packets all look so alluring. so I know when I need to start seedlings. Lettuce and kale starts will most likely be sown in the next couple of weeks. that I just recently decided on. starting seedlings should help me get through the worst of it. My order should get here early next week. all rolled into one when that box arrives. How's your spring garden planning coming along? I look forward to this every single year! :) I can't wait to get my hands in the dirt!! I'm sure after all of the snow y'all get, spring is even more welcome!